The Corp must pay 5credit or take 1 bad publicity. Remove Mining Accident from the game instead of trashing it. If the Corp has less than 5 when the Runner plays Mining Accident, must they take the bad publicity? I've played this card for a bit and wanted to share some observations. It's one of the more generically strong Anarch cards of the Red Sand cycle; it's just a good card and doesn't require a special self-damage or tag-me archetype. It's the new mini Vamp and much more fair in design. What's Mining Accident good at? The bad pub from it makes running super efficient. In particular, the conspiracy breakers (Paperclip, Black Orchestra, MKUltra) are a solid breaker suite which benefit from bad pub. Bad pub contributes to install costs as well as break costs. Also, Blorchestra and MK have very high minimum expenditures; even the cheapest code gates and sentries cost 3. Cutting that down to 2 or 1 real s pays off quickly when making repeated runs. MA is good early because a central is typically open and the corp cannot afford to lose 5; it opens them up to too many vulnerabilities (Medium, Account Siphon, etc.) & pushes them further away from IPO's play cost. Basically, being set behind your whole opening credit pool is cannot be endured on turn 2 or 3. People will lean towards playing MA in Valencia because the words "bad publicity" appear on the Valencia ID. I don't think the card needs to stay there but the nice thing about Val is you expect to already have bad pub. Val is great for run-based tactics so cards like Dirty Laundry, Desperado, and Street Peddler (because you can install during a run) are a natural fit. Finally, without Blackmail, I don't see any corp bothering to play bad pub removal. It's just not worth the tech slots & there are far worse things to worry about. When's MA bad? When the corp is rich & can just lose 5 without much harm, when it's late in the game & giving a bad pub isn't consequential, when all central servers are ICEd up & meeting its condition becomes expensive. It's bad quite often, which is why it's a balanced card. I think the cheese bad pub spam strategies featuring Itinerant Protesters are going to be bad, interesting jank but not competitive. For one, Alice, Hacktivist, & Maw already attack corp hand sizemore effectively. Hack & Maw in particular are random discards which makes them quite valuable post-Jackson. For two, as I've learned playing against those cards, the correct move as corp is often to just empty your hand of useful cards & play in topdeck mode. It's not great but it's also not so bad that building a runner strategy around it is worthwhile. 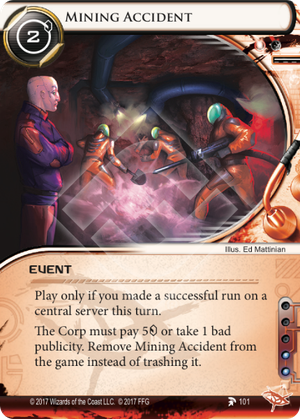 This card might as well read "Play only if you made a success run on a central server this turn and the corp has less than 5 in their credit pool. The corp gets 1 bad publicity. Remove Mining accident from the game instead of trashing it." And that would make a good card. As the text is now it's a great card. If the corp is low on credits Mining Accident gives the corp 1 bad pub for 2, provided you've hit a central earlier in the turn. Hitting a central is not that hard, archives in particular tends to be pretty poorly defended. Those two credits aren't going to be the problem either. And they payoff is great. If you score a bad publicity that's a one credit discount in every run, including when trashing cards. What's more there are is nice trick you can pull if the corp has bad pub: Itinerant Protesters. Now the problem with the protesters used to be that landing more than a few bad pub (i.e. Valencia Estevez: The Angel of Cayambe plus Corporate Scandal) is difficult. With Mining Accident however it's relatively easy to land bad pub. Throw in a few bouts of Investigative Journalism and it's now possible to give the corp 5 bad pub. 5 bad plub plus Itinerant Protesters means the corp cannot have any cards in HQ after the end of their turn. Oh, and Jackson Howard is going away so agenda flood will be hard to deal with anyway. Archives dig for 7 points anyone? Obviously anarch will profit a lot from Mining Accident but there's another faction that can make good use for it. Anarchs aren't the best at keeping the corp poor. They're decent, but not the best. That title goes to criminals. For criminals a Mining Accident can be ridiculously easy to land, if the corp has 9 or less credits it's a two step process: Account Siphon, Mining Accident. If the Mining Accident gets played early enough in the game the resulting bad pub can help alleviate the typical criminal weakness of expensive breakers for the rest of the game. Even if the corp has more than 4 credits Mining Accident can still have some value. It forces the corp to either lose 5 credits or to get bad pub. While usually losing 5 credits for the corp is the better option under the right circumstances you can make the corp choose between leaving an agenda on the board next turn or taking a bad pub. The corp has some counter plays of course. The most obvious ones post-rotation are Exposé() and Sacrifice(). HB and Jinteki no longer have a zero influence way of getting rid of bad pub however. Pre-rotation there are a few more options: Veterans Program, Clone Retirement(), Restoring Face(), Rex Campaign(), Elizabeth Mills(), Witness Tampering(). The near future is going to be hell for corporate PR departments.